While no firm can guarantee the outcome of a particular medical procedure, it is possible to use clinical data from providers to assess the general nature of medical outcomes. For anyone considering destination medical care, the quality of care and the probable outcome are of great importance. Consequently, Soter Healthcare evaluates and shares information on the medical care delivered by providers in the Soter Center of Excellence Network. 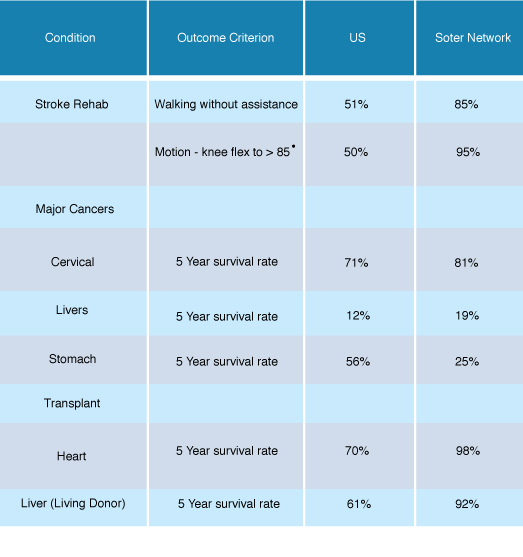 The table below shows clinical outcomes for a sample group of medical procedures and conditions. Additional information is available by contacting us directly. The information above is compiled from provider sources and is believed to be accurate at the time it was gathered. This material is provided for the purpose of general comparison. It is not intended to be comprehensive and does not cover all diseases, physical conditions, ailments or available treatments.